Hedge funds were down 0.13% as of Q1 2018 – their worst quarterly showing since Q1 2016. Assets of the industry expanded by US$31.1 billion over the past three months largely on account of investor subscriptions which stand at US$31.8 billion since the start of 2018. The US$256.0 billion CTA/managed futures mandated hedge fund industry has seen its asset base contract by US$13.5 billion year-to-date, with managers witnessing the highest performance-based losses of US$12.6 billion among strategic mandates for Q1 2018, while investor redemptions stood at US$0.9 billion over the same period. The Eurekahedge CTA/Managed Futures Hedge Fund Index was down 1.54% year-to-date. The US$1.65 trillion North American hedge fund industry posted the steepest performance-based losses among regional mandates for Q1 2018, totalling US$1.2 billion while net asset inflows to the region stood at US$20.1 billion – almost 17% lower compared to the net asset inflows recorded in Q1 2017. Multi-strategy mandated hedge funds saw the highest net outflows among strategic mandates for Q1 2018 following steep redemptions worth of US$15.3 billion in February – the highest monthly redemption on record. 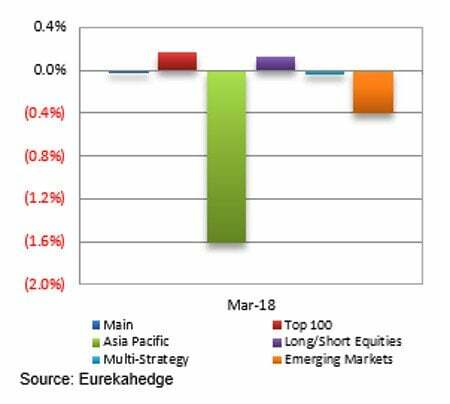 The Eurekahedge Multi-Strategy Hedge Fund Index was down 0.71% in March and down 0.08% year-to-date. China-US trade war concerns jolted markets, with Asia ex-Japan hedge funds down 1.44% in March, and 0.18% for Q1 2018. Equity-long/short managers focused on the region posted their worst quarterly results since Q1 2016 and are down 0.41% for the year. Japanese managers were also down 1.69% in March and down 1.58% year-to-date – the worst performing regional mandated funds in Q1 2018. The Eurekahedge Crypto-Currency Hedge Fund Index was down for three consecutive months, losing roughly 34.7% in March bringing its Q1 2018 losses to 48.37%. In contrast, bitcoin has lost over 50.0% over the same period. Amidst a slowing launch pipeline in Asia, new funds launched in 2018 are charging higher performance and management fees of 17.75% and 1.41% respectively. In contrast, hedge fund start-up fees stood at 15.43% and 1.30% respectively in 2017. For more details, please refer to the 2017 Overview: Key Trends in Asian Hedge Funds report. Hedge funds registered their second consecutive month of losses since the start of the year, with the Eurekahedge Hedge Fund Index declining 0.54% in March, while still outperforming the MSCI World Index which ended the month down 2.21%. The average return of the global hedge fund was pulled into negative territory in March as choppy trading conditions across commodities, and weaker global equity performance continued to affect the trading scene. March was marked by investors' concerns over the US and China trade war which made headlines throughout the month and negatively affected the global equity markets, most of which ended the month in the red. As of Q1 2018, hedge funds are down 0.13%, ahead of underlying markets as the MSCI World Index posted losses of 2.24%. Close to 55% of managers were in positive territory, and roughly 6% posted year-to-date returns in excess of 10% over the first quarter. Latin American managers led among regional mandates in March with their 0.81% gain, while distressed debt managers topped the table across strategies, gaining 5.74% over the month. Looking at year-to-date performance, Latin American managers outshone their peers from other regions with gains of 5.19%. Meanwhile, distressed debt hedge fund managers posted the best Q1 2018 performance among all strategies based on preliminary numbers, gaining 7.83% over the quarter, followed by relative value managers who generated gains of 1.01%. Performance across regional mandates was a mixed bag in March, with Latin American mandated hedge funds the only regional mandate to end the month in positive territory, up 0.81% as manager's performance was supported by the strength in underlying equity markets in Latin America. The Ibovespa Index was up a modest of 0.01% in March and up 11.73% year-to-date, supported by interest rates cut and falling inflation numbers in Brazil. On the other hand, Japanese hedge funds posted the steepest loss among regional mandates, declining 1.69% during the month. Asia ex-Japan hedge funds were also down this month, losing 1.44%, followed by European and North American hedge funds which were down 0.72% and 0.14% respectively. 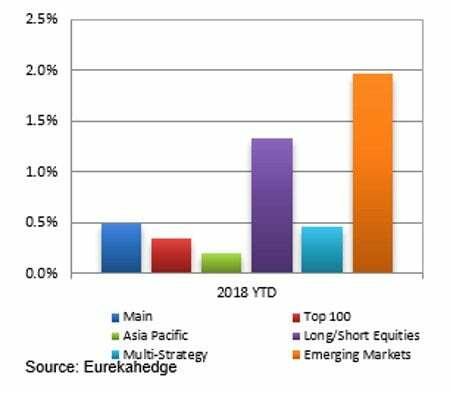 As of Q1 2018, the Eurekahedge Latin America Hedge Fund Index led among regional mandates and was up 5.19% year-to-date. Meanwhile, Japanese dedicated mandates have been the worst performers for the year with the Eurekahedge Japan Hedge Fund Index down 1.58% year-to-date amid yen appreciation. North American and European hedge funds were also down 0.36% and 0.32% over the same period with the uncertainty surrounding Brexit likely to complicate things further for the European region. Asia ex-Japan mandates also languished, down a modest 0.18% year-to-date. The asset weighted Mizuho-Eurekahedge Index declined a modest 0.02% in March. It should also be noted that the Mizuho-Eurekahedge Index is US dollar denominated, and during months of strong US dollar gains, the index results include the currency conversion loss for funds that are denominated in other currencies. The US Dollar Index declined 0.71% in March and down 2.33% for the first quarter of the year. Performance was mixed across the board among the suite of Mizuho-Eurekahedge Indices with the Mizuho-Eurekahedge Top 100 Index posting the best gains, up 0.17% during the month. This is followed by the Mizuho-Eurekahedge Long Short Equities Index which gained 0.13% over the same period. The Mizuho-Eurekahedge Asia Pacific Index was down 1.62% during the monthfollowed by the Mizuho-Emerging Markets Index which lost 0.39% over the same period. Asia Pacific mandated funds slid lower on another fall in equity markets, with the MSCI Asia Pacific Index plunging 2.45%. The Mizuho-Eurekahedge Multi-Strategy Index also languished in March,declining by 0.05%. As at 2018 year-to-date, the Mizuho-Eurekahedge Emerging Markets Index led the tables, up 1.97% while the Mizuho-Eurekahedge Asia Pacific Index posted a marginal gain of 0.20% over the same time period. The CBOE Eurekahedge Volatility Indexes comprise four equally-weighted volatility indices – long volatility, short volatility, relative value and tail risk. The CBOE Eurekahedge Long Volatility Index is designed to track the performance of underlying hedge fund managers who take a net long view on implied volatility with a goal of positive absolute return. In contrast, the CBOE Eurekahedge Short Volatility Index tracks the performance of underlying hedge fund managers who take a net short view on implied volatility with a goal of positive absolute return. This strategy often involves the selling of options to take advantage of the discrepancies in current implied volatility versus expectations of subsequent implied or realised volatility. The CBOE Eurekahedge Relative Value Volatility Index on the other hand measures the performance of underlying hedge fund managers that trade relative value or opportunistic volatility strategies. Managers utilising this strategy can pursue long, short or neutral views on volatility with a goal of positive absolute return. Meanwhile, the CBOE Eurekahedge Tail Risk Index tracks the performance of underlying hedge fund managers that specifically seek to achieve capital appreciation during periods of extreme market stress. 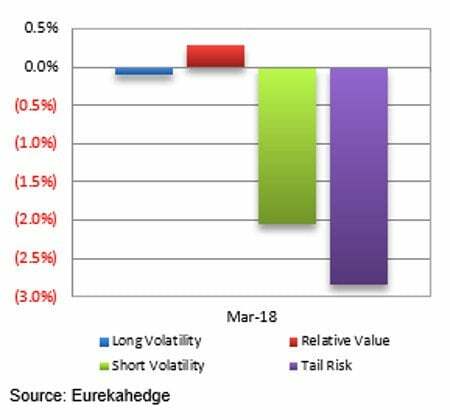 During the month of March, the CBOE Eurekahedge Relative Value Volatility Index led the tables with gains of 0.28% while all other volatility strategies languished into negative territory with the CBOE Eurekahedge Tail Risk Hedge Fund Index posting the steepest decline, down2.85% preliminary numbers show. The CBOE Eurekahedge Short Volatility Index was also down during the month with loses of 2.05%. The CBOE VIX continued to rise, though in a gradual pace climbing 0.60% in March. While the returns for the long volatility hedge funds are still being populated, early figures show that the strategy is also down 0.11% during the month. On a year-to-date basis, the CBOE Eurekahedge Short Volatility Index posted the steepest loss, down 8.70% followed by the CBOE Eurekahedge Tail Risk Volatility Index which had declined 2.50% over the same period. 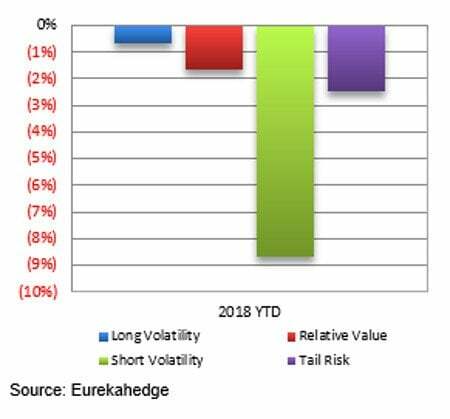 The CBOE Eurekahedge Relative Value Volatility Index and the CBOE Eurekahedge Long Volatility Index lost 1.64% and 0.65% as of first quarter of the year. Launched in 2001, Eurekahedge has a proven track record spanning over 16 years as the world's largest independent data provider and alternative research firm specialising in global hedge fund databases and research. Headquartered in Singapore with offices in New York and Philippines, the global expertise of our research team constantly adapts to industry changes and needs, allowing Eurekahedge to develop and offer a wide array of products and services coveted by institutional investors, family offices, accredited investors, qualified purchasers, financial institutions and media sources. In addition to market-leading hedge fund databases, Eurekahedge's other business functions include hedge fund research publications, due diligence services, investor services, analytical platforms and risk management tools.